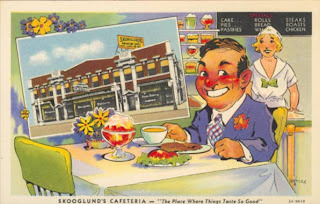 Skooglund's Cafeteria "The Place Where Things Taste So Good" was located on Wilson, between Clifton and Racine. The back of this image, circa 1932, reads: "During your visit to Chicago DINE and STOP at Skooglund's Cafeteria and Hotel Lafayette. 1138 Wilson Ave. Near Routes W. S. #12 and #14 at 4600 North. At the above address over 25 years." The below image of the building was captured from Google maps using their new street view feature. 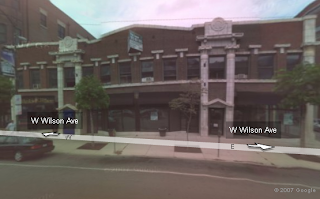 Today the building houses Nick's on Wilson and a bunch of empty storefronts. It's one building I wish I could afford to buy! "Watch it wiggle, see it jiggle. Cool and smoothy, Jello brand gelatin. Of all desserts you'll love the one that tastes so lights and makes such fun. Make Jello gelatin and make some fun. J-e-l-l-o!" OK, I'm about 50 years off, but the history of aspic, gelatin, and, eventually, Jello is fascinating nevertheless. I smiled when I saw the postcard's customer eating it! I used to eat a lot of Jello when I was a kid--orange and lime were my favorites. It was a staple at family gatherings and Lutheran socials. I can't remember the last time I've had it--must be years. I've rarely made it since leaving my parents' house.